Soup is one of my favorite meals and this recipe is my kind of soup. It is chock-full of yummy things I appreciate in a soup- Wild Rice, Rotisserie Chicken, broth and sauteed vegetables. This recipe is my adaptation of a Cooking Light recipe from years ago. It is a little labor-intensive but it makes a large pot of soup that is very tasty and hits the spot for days! In December, a friend and I attended a cooking class at one of our favorite restaurants, Marché. They offered monthly topical cooking classes and we signed up to take the December cookie-making class. We had a fabulous time. To get to be “behind the counter”, watching and experiencing first hand the magic of chef Tom in Marche’s kitchen was surreal. He was delightful and humble. We were eagerly taking notes on all of his great tips. One of my favorite “take aways” from our class was: Read through the entire recipe before making the dish and mark or re-write the recipe in your own way. Tom encouraged us to rewrite or restructure recipes to make them more readable to our personal style and to make them simpler to follow. This can be done by bracketing steps to break it down, or indicating the amount of time each step is estimated to take. Some people prefer having the ingredients listed on top and instructions below while others write ingredients throughout the instructions. Whatever is your best way of tracking, is the way you should go. 1. Prep vegetables and chicken. 2. Prepare rice according to package directions. 3. Heat oil in a large pot over medium-high heat. Add chopped onion, sweet potatoes, carrots, garlic and mushrooms. Saute for 6 minutes or until onion is tender. Add tarragon, thyme, water, sherry, broth and milk into the vegetable mixture. Bring to boil. Reduce heat and simmer for 20 minutes or until slightly thick. 4. Stir in cooked rice and chicken. Cook for 10 minutes or until thoroughly heated. 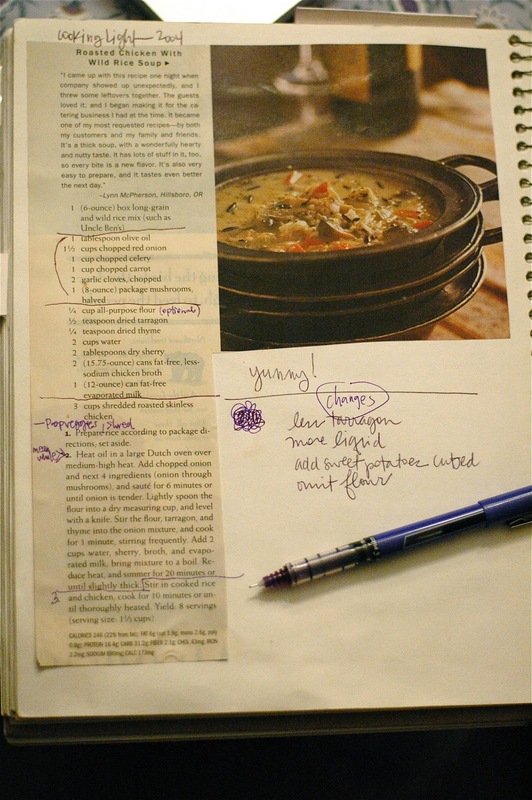 So, don’t be afraid to mark on your recipes, or re-write (or re-type) them with the format that makes sense to you. It will help your cooking to flow more smoothly. Lesson learned! Oh, and read through the entire recipe before you begin, so that you know the whole scope of the process from the start. And enjoy some savory soup! Thanks, mom, for letting us know your suggestions. I definitely think it is a good recipe to alter to your liking. I hope your friend and you both liked it. About broth: sometimes if I don't have fresh or canned broth I use boiled water and chicken bouillon or chicken base from the jar. It works well, I just have to watch the salt. Julie, This looks great! It kind of reminds me of Thanksgiving soup. What about adding stuffing to the mix and sweet potatoes? Also, using heavy cream and putting in some craisins. I am not a fan of tarragon, do you think I could put rosemary instead? I am getting inspired! Melissa, I loved that Thanksgiving Soup idea with stuffing and all! Sure, take out the tarragon, sprinkle in the rosemary. The original recipe calls for evaporated milk. You can use it, or cream or I think my mom omitted the milk completely. And you know I would add Craisins to anything! Let me know how it goes. Today is rainy in Nashville and a bowl of soup sounds good right now! 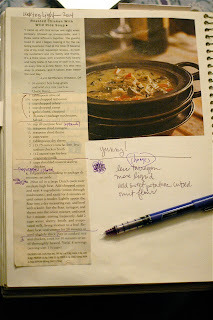 I love the idea of “re-writing” the recipe. I got all mixed up on a recipe this weekend that wasn't hard, it just wasn't written in a way that made sense to me! Love to you, Julie! I just made a pot of this yummy soup and I am not the least disappointed! It is the perfect creaminess, without being heavy, but I think substantial enough to serve my soup-is-not-a-meal husband (I am going to try tonight for dinner). I didn't know about the sweet potatoes, but they are great and add a different texture. I usually eat them roasted savory or sweet and cinnamony, but never in soup. Good addition, Julie! Love all your recipes and can't wait for the official Julie Cookbook one day! So thankful for @tcbandages and @target ! Finally, bandages with multi shades of skin tone available on the store shelf. As a social worker, teacher and friend this is a longing fulfilled!